The management committee of the Players Football Association of Ireland have said they are not surprised by how the FAI approached yesterday’s hearing in front of an Oireachtas committee. The players’ body are also keen to talk to individual board members in light of the FAI’s admission that only three board members were aware of John Delaney’s €100k “bridging loan” to the FAI in 2017. 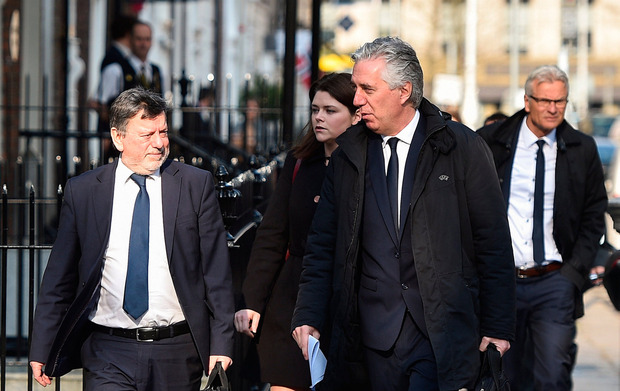 There have been widespread calls for the FAI Board and John Delaney to step down following their appearance in front of an Oireachtas Committee yesterday. Delaney said he could not answer any questions in relation to a €100k “bridging loan” he gave the Association in 2017 because of legal advice he had received. It was left to FAI President Donal Conway to address most of the questions from the Committee over a seven-hour session at Leinster House. In a statement released this evening, The PFAI said that “while many of the public were shocked by the inability of those attendees from the FAI and in particular the blatant stonewalling by the former CEO, unfortunately for us as players and for our representatives this is the standard response that we have become accustomed to over the last few years”. “Whilst the behaviour and attitude of yesterday’s delegation did not shock us, we were however very interested to hear the admission from the Board members that were in attendance yesterday, that they were not always made aware of relevant information that require their attention and approval. The PFAI and FAI have had a contentious relationship in recent tmes with the two organisations butting heads over the stand-off regarding the payment of wages to the players at Bray Wanderers. “For years, League of Ireland football has been the poor relation, lagging behind grass roots and the men’s international team in terms of importance,” added the statement. PFA Ireland Chairman Gary Rogers added: “Yesterday’s performance by the FAI was a new low point for Irish football. In a country where soccer remains the most popular sport, the lack of priority given to our own league is embarrassing. “The FAI has no interest in the views or fates of the players, this is borne out by the fact that there has never been any player representation on any FAI committee or board. Also, last year during protracted difficulties at Bray Wanderers and Limerick, the FAI refused to get into any meaningful dialogue with our representatives and even had the audacity to look for €150,000 to put into a fund to pay for our own wages. “The prize money available for winning the League is disgraceful; it has halved since 2007 and is disproportionate to what clubs pay for affiliation fees. There needs to be root and branch reform within the FAI. We note from yesterday’s Oireachtas meeting that the FAI appear to be willing to change the governance of the association going forward. We hope that their attitude towards change also includes the players in the League and the League in general. “We have recently written to the FAI Board of Management seeking a meeting in relation to starting negotiations on a collective bargaining agreement for the players. We feel this is long overdue and necessary and will ultimately benefit the players in the league and we hope that the FAI will be willing and able to implement same. The statement was signed by the PFA Ireland Management Committee – Gary Rogers, Áine O’Gorman, Paul Skinner, Dean Clarke, Oscar Brennan, Brendan Clarke, Paul O’Conor, Luke Byrne, Shane Supple.